What Bill Caballero is really saying is that the floor at Voz Alta Project in Barrio Logan is open to the worst players in San Diego, even if only for a moment. And, so long as they learn from their failures they’ll almost certainly win a few more choruses with the house band if they have the nerve to try and catch Caballero’s eye the next time they come to the jam. No more than 1000 square feet of space within the building at 1754 National Ave., Voz Alta is where some of San Diego’s best musicians might drop by to sit in with the house band Caballero leads every Thursday night. It costs nothing to get in (tips are appreciated), though musicians often have to leave their pride behind at the doorway. The house band (which sometimes includes local music journeymen Kiko Cornejo Sr. and his son Kiko Jr. on timbales/percussion, Andy Esparza on bass, Ignacio Arango on guitar, Paul Lopez on congas/percussion and others) minus leader Caballero get a part of the tip jar; the hackers and nobodies must await their turn in the appropriate agony of anticipation. Bill Caballero is one of San Diego’s many unsung musicians. Week in and week out he shows up to Voz Alta and does his musical thing. He doesn’t get paid to play here and he rarely gets the props that he deserves for helping keep the jam session tradition alive. He does it for the love of the music and his willingness to give back to his community. Voz Alta was an idea that came from a small group of renegade Chicano poets who called themselves the Taco Shop Poets as well as some members of the defunct El Campo Ruse and the Chicano literary publishing house, Calaca Press. It has its origins as an underground art gallery and performance space. The first incarnation was in a 550 square foot storefront on E St. in Downtown. It later moved to Broadway and 16th next door to the late, great dive bar, Landlord Jim’s. It’s now where a space like this belongs: in Barrio Logan. In March of 2002, Brent Beltrán, a columnist here at San Diego Free Press, was tasked by his fellow Voz Alta board members to call Caballero up and ask if he’d like to start a jam session. He also remembers another reason for Caballero’s reluctance. 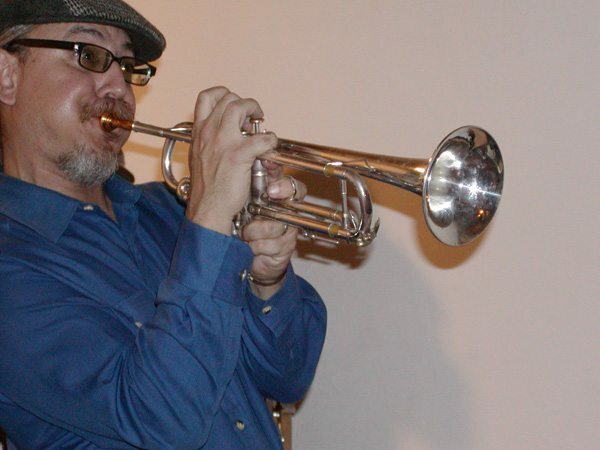 Castellanos is regarded by many as the West Coast’s leading jazz trumpet player. Trumpet players can be, er, sensitive about their standing in the trade. At the time, Castellanos was about to close an agreement for a jam at another location downtown, and, reassured, in April of 2002 Caballero took on the musical responsibilities at the first location of Voz Alta, on E. Street. For a short period of time Caballero left Voz Alta and took his jam session to a fruteria on Third Ave. in Chula Vista. Shortly after that a few blocks down to Mangia Italiano. He eventually found his way back home to Voz Alta in Barrio Logan where’s he’s been for about five years or so. Not long after the opening 11 years ago Voz Alta became a showcase for instrumental improvisation on latin and latin jazz standards. And because the jam is open, intensely creative combinations of the unexpected and the accepted will form real… live… music. Big dogs, local and out of town, will show up here: Pianists Lynn Willard and Irving Flores, and the child prodigies, The Pizarro Brothers; tenormen Gary Lefebvre, Bob Campbell and Mike Carnahan, and Los Van Van percussion player Changuito. Gilbert Castellanos has played here. A percussionist who has been all over Los Angeles for decades with his own band, Jack “Mr. Bongo” Costanza, will appear this Thursday. When musicians are in town they know they can come to Voz Alta on a Thursday night and sit in. Despite his claim to absolute egalitarian inclusion and anecdotes condemning what he calls the “elitism” of some visiting hot players, Caballero has no trouble humbling fumbling and inattentive players with remarks they need to hear. Anyone who’s ever tried to improvise will taste the pepper in that remark. Solos ought to be like stories, with a beginning leading to some hellacious developments that are resolved or sum-up-able at their end. Caballero’s language is quirky, unpredictable and not solely aimed at instilling the humility necessary in aspiring musicians; the language in his newsletter puns, rhymes, and toys around—sometimes aimlessly — with meaning. There’s always been a cross-border mix of hipness and tradition in Barrio Logan, if not everywhere in San Diego. Voz Alta is one of those open doors. The Taco Shop Poets had some roots in Tijuana and so does the longest-lived regular and principal person at Voz Alta, another Beltrán nicknamed Chato, who’s still behind the counter in back of the band, dispensing affordable liquids. He’s also the guy who keeps the walls hung with good art — glorious canvases and boards covered in bright, dramatic designs and messages. He even talks friends of the place into bringing in sausages and carnitas and burritos, sometimes. One of Voz Alta’s basics is its happiness with disorganization and its unmeditated inclusiveness. 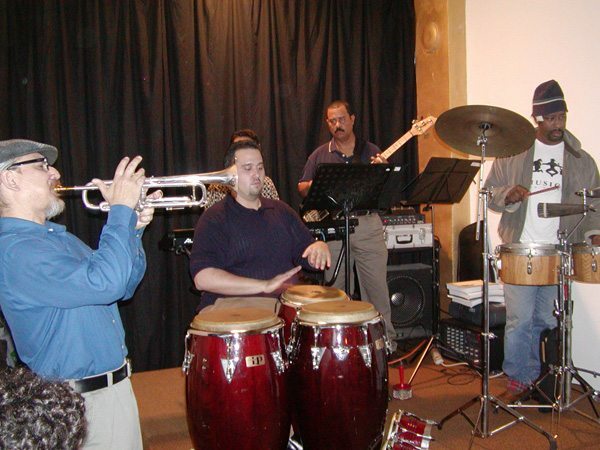 Caballero’s Latin Jam is every Thursday from 7-10pm at Voz Alta Project in Barrio Logan. It’s free but donations are graciously accepted. Musicians of various levels are welcome to sit in. Just leave your ego at the door. I’m honored to have helped start this weekly San Diego musical treasure. Props to Bill for taking the chance. And I, for one, am glad it’s still going! Thank you, mil gracias, a thousand thanks, obrigada, grazie, Bob Dorn! Thank you for the article on the jam and for singing the praises of “Mexican Miles.” I wish more people would document the many hysterical/historical moments. One of those was a few years back when a neighbor came in, attracted by the music. Presumably this caballero was on his way back from grocery-shopping–or perhaps returning from the food bank. After the song was finished, the man approached the current installation piece as if it were an altar, genuflected and crossed himself, then tithed a can coffee. May the lights be kept on!